countries and quality services in selection of hotels, guides, transfers, routes, sightseeing and gastronomy etc. 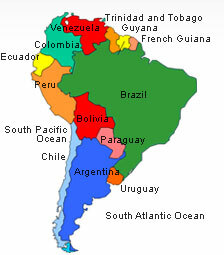 The flavor of Latin America is truly unique, different and diverse. The Color and culture are worth witnessing. They have a zest for Carnival, Music, dance, Celebration of Life and that bring us in touch with the core purpose of Living. The Passion for Tango and Football along with the gyration of the Samba only speak of the intense Latin way of Life and Love! The natural and ecological diversity ranging from the dense Amazon to the Atacama Desert to the flora and fauna of Patagonia to the Glaciers to the pampas make a Latin Rendezvous interesting and adventurous. The citadel of Machu Picchu and the vibrations of the Sacred Valley lift the spirits. Latin America is certainly a once' in a lifetime' destination and we bring it closer to you. A Life well-travelled is a Life well lived ! Discover the World et thyself !